For those of you who know me, I am not one to pass up anything that's free or discounted. I tend to go to sporting events when there is a promotion, am a sucker for free-be's at conventions, and will print free coupons off the Internet for products I don't need (i.e. $1 off 7th Generation products - c'mon the only thing I do to "go green" is (sometimes) recycle in the summertime) and probably spend more money on these products then I normally would. Who spends $6 on a container of dish washing liquid anyway? Ok, this girl, when she has a coupon. Tomorrow is a HUGE day for "free" things. Both Starbucks and Tim Hortons have free food from 6am - 10am. 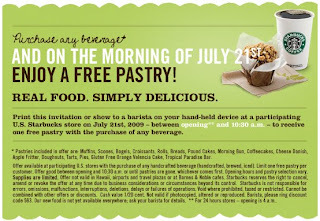 If you go to Starbucks between the hours of 6am and 10am and wait in an absurdly long line and have a coupon, you can get a free pastry with the purchase of a beverage. If Starbucks isn't your cup of tea because their drinks are too pricey or the drive-thru girls are too friendly, head over to Tim Hortons where you can get a free blueberry doughnut. Take that Starbucks, Tim's isn't even going to require a purchase or a coupon. Update: I was just watching 10tv and according to Andrea Cambern I will have to buy a drink at Tim's tomorrow. But then, if you're like me, you'll map out your morning to hit up both locations before work. I plan on first going to Starbucks (with The Boy! ), wait in the very long line only to be told they are out of croissants (because they are cool like that), settle on something else, then head over to Tim's for my free doughnut. I'm thinking I'll get the one shaped like a flower. Morning Update: I was able to go to both Starbucks (with The Boy!) and then Tim's (on my own). Starbucks required that we both check out seperately. I got to Tim's all ready to buy a bottle of water to get my free blueberry doughnut and was told I didn't have to purchase a drink, they'd just give me a doughnut. What made it even better was I got any doughnut of my choice. I chose the honey cruiller. Tim Hortons wins the free pastry/doughnut battle! Contrary to the title of this post, not all good things in life come free. Take my friendship for example. It took a large check from your mom to keep me around; and, I think I might still have the check to prove it!